My adoration of Rouge Bunny Rouge Bronzing Powder in Netherway Cove is no secret...I have used it almost daily since June and hit pan by October...this is one well-loved bronzer! As winter rolled around, however, I realized that it might be time to lighten up my bronzer shade...fortunately, there's At Goldcombe Bay. It is a perfect light brown...no peach or orange tones here! Above: At Goldcombe Bay comes in a lovely creamy orange and black compact. Above: At Goldcombe Bay is the lighter of two shades of this bronzer. Above: The compact comes with a generous mirror. Above: At Goldcombe Bay is a light tan with absolutely no orange undertones...definitely refreshing for a bronzer! Above: A swatch of At Goldcombe Bay in outdoor light. Above: Netherway Cove and At Goldcombe Bay side by side! Note that Netherway Cove is a bit darker and deeper in tone. 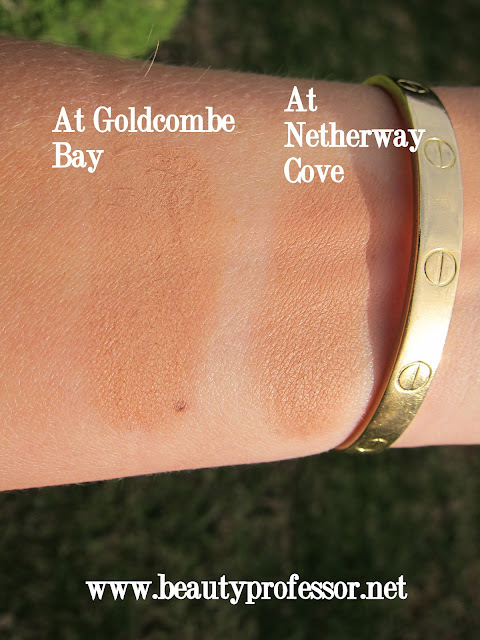 Above: Swatches of At Goldcombe Bay and Netherway Cove...Goldcombe Bay is a bit paler and slightly more golden in tone, while Netherway Cove is slightly "bronzier" in nature. Above: Swatches of the bronzers in outdoor lighting. Bottom Line: Rouge Bunny Rouge At Goldcombe Bay bronzing powder is a perfect winter alternative to my favorite, slightly deeper, bronzier Netherway Cove! 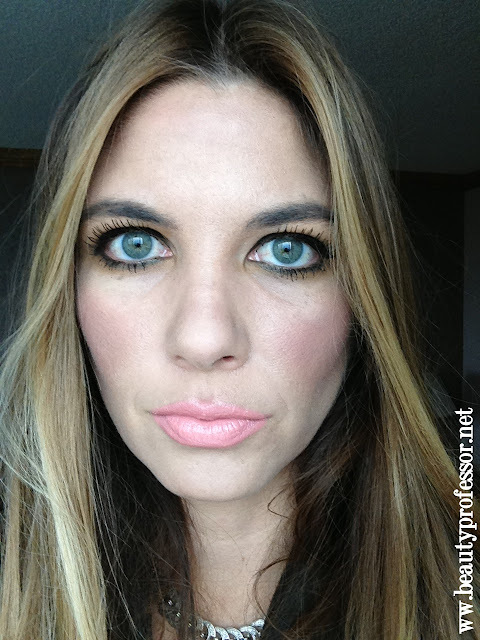 It is pigmented, long lasting, friendly to sensitive skin and looks oh-so-natural in a colder climate. I am so happy to have this! Just a quickie comment....I think I am going to be ordering this bronzer soon! It looks absolutely gorgeous. Your makeup looks stunning in this pic. Can you tell me what blush and lipstick/gloss you have on? Thanks for your question and sweet compliment...I am so excited that you are going to be getting this bronzer...I suspect you will love it! Wow these both look like great bronzers, I actually think the one you've been using might be the one that'd work best for me. I have get to try RBR but it's on my list! Hi Catherine...thanks for stopping by! Of all the bronzers I have used in the last few years (Dior, Guerlian, Laura Mercier to name a few), the Rouge Bunny Rouge bronzers are by far the best!